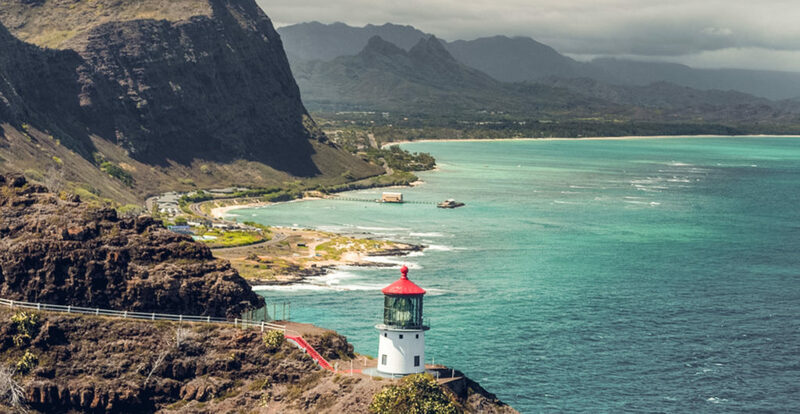 Must Do in Oahu. 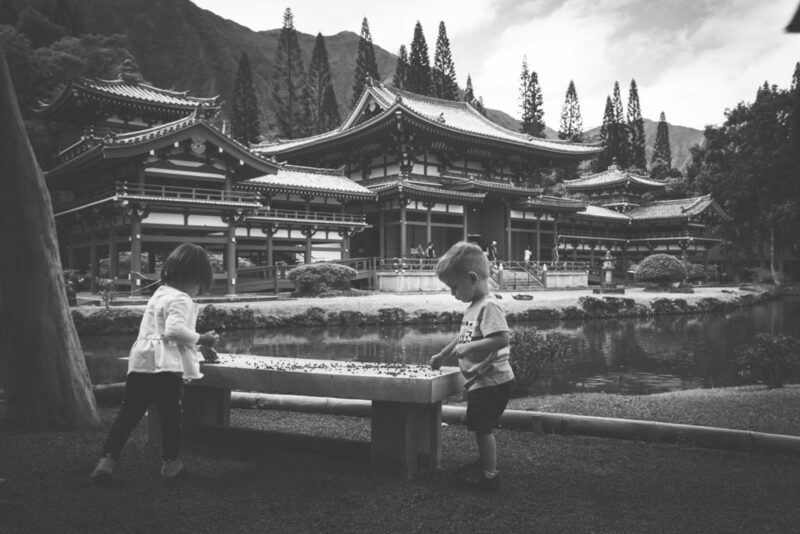 Things to do in Oahu with kids. The Polynesian Cultural Center (or PCC) is serious fun for all ages but it’s an absolute must when doing Hawaii with kids. As Hawaii’s most popular paid attraction since the 70’s, you don’t want to miss it. They’ve got beautiful grounds, world-class performances, and fun-filled learning opportunities in every corner. Use this link to get a free dinner when booking! If it’s not too late for your little one, be sure to stay for the night performance – Ha: The breath of life. One of the best luaus on Oahu. Active. Educational. Stroller Friendly. All Ages. 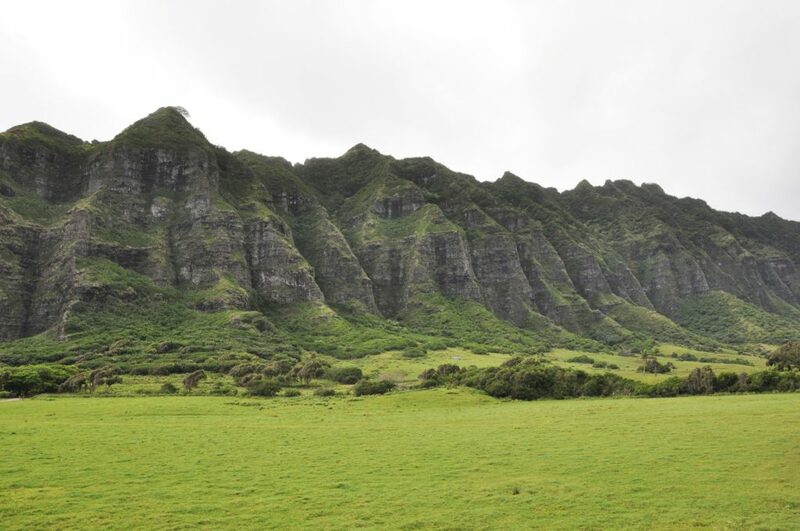 Come to see Jurassic Park for yourself at Kualoa Ranch! If you are traveling with babies or toddlers you can take the movie tour, visit the petting farm or head to the secret beach. Older kids will enjoy the zip lines, ATV tours or horseback rides. They offer several educational programs for kids to learn about nature and conservation. 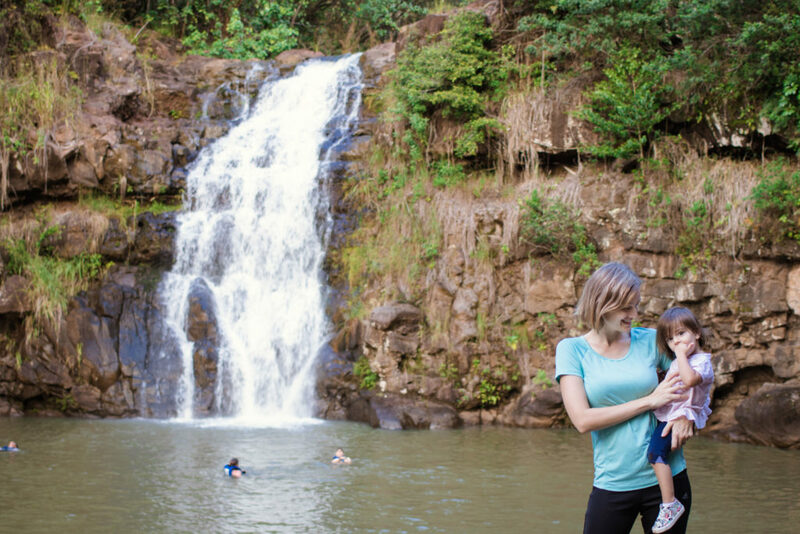 Get away from the hustle and bustle to spend some time soaking up the beauty of Waimea Valley. (Not to be confused with Waimea Canyon which is located on the island of Kauai.) Along the trail, plants are labeled and cultural displays are set up. This stroller friendly, paved trail dead-ends at a small waterfall. Bring your swimsuits and jump right in! There are changing rooms near the waterfall. Life jackets are provided and a lifeguard is on duty. It’s an absolute must do in Oahu. Stroller Friendly. Educational. Active. All Ages. 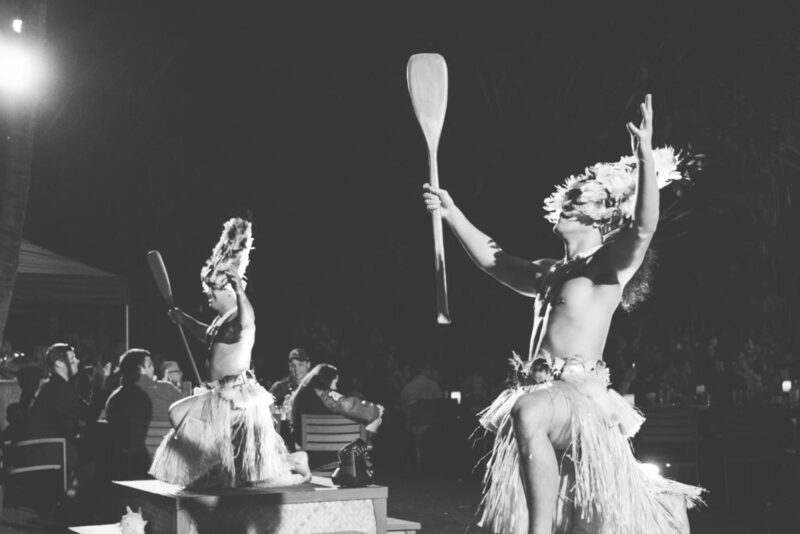 You simply can’t visit Hawaii without going to a Luau. Technically these might still take place on a beach but it’s a whole different type of experience. The top 3 kid friendly luau’s in Oahu are found at Aulani, Paradise Cove the Polynesian Cultural Center. Aulani and Paradise Cove are both located in Ko Olina, on Oahu’s leeward (West) side. 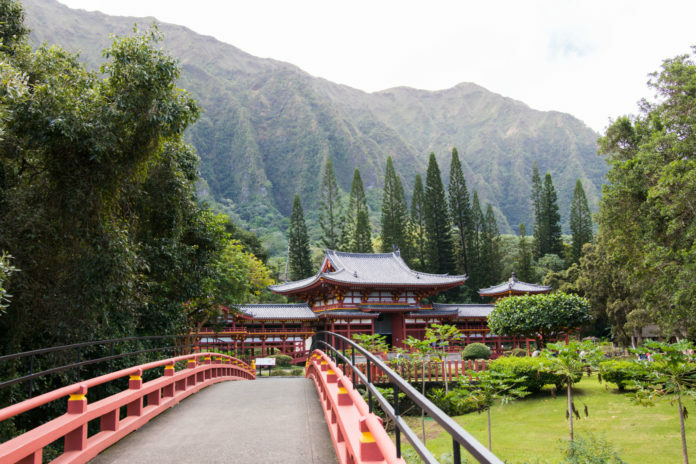 Valley of the Temples is set at the base of the Ko’olau Mountains. Towards the back, you will find the Byodo-In Temple. You’ll feel completely transported in this Japanese replica of the UN World Heritage Site in Uji, Japan. Kids will enjoy ringing the bell and feeding the koi fish. 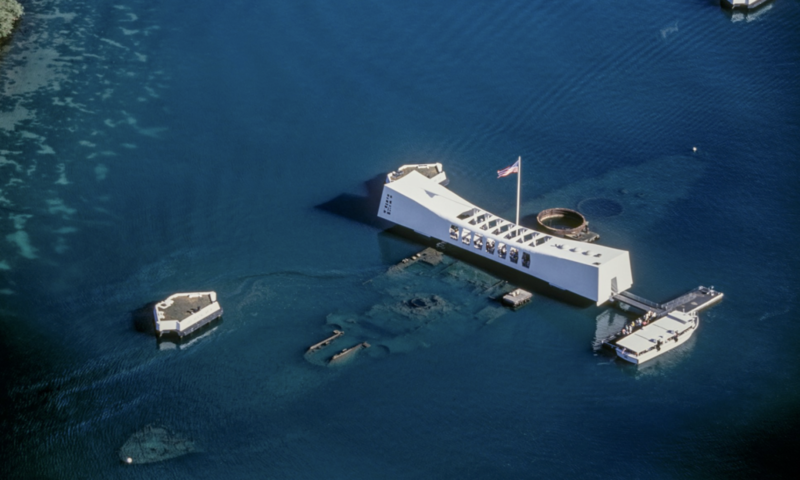 Visiting Pearl Harbor is a sobering experience where visitors can pay their respects. You can purchase combinations tours of the USS Arizona, Battleship Missouri, Bowfin Submarine and aviation museum, making this a great stop for children and teens. It’s a difficult stop with babies and toddlers because guests are expected to remain quiet. Security is tight and bags are not allowed. You can place baby essentials into a clear ziplock bag and hand carry it around which is just a bit annoying. Very small children and babies are not permitted in the Bowfin Submarine either. Go early, this stop draws a crowd. Educational. All ages but best for older children and teens. 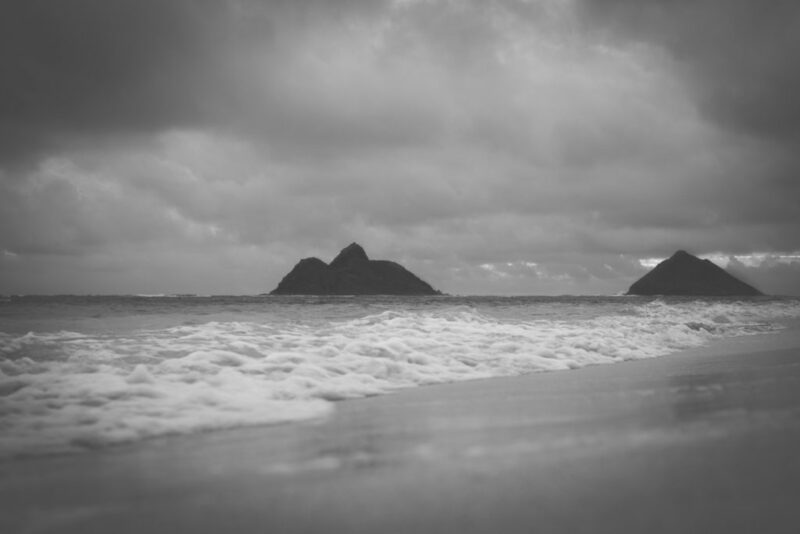 Lanikai Beach is a must see in Oahu. To see this view from above, head to the Kaiwa Ridge Trail or Pillbox Hike. It is a short ridge hike on the windward side with three decommissioned pillbox bunkers along the way. While challenging, this is known as one of the easier hikes on the island. Plan for 1 hour to 90 minutes round trip, many families stop at the first or second pillbox and head back down. Avoid going after rain, things can get slippery. You’ll find the trailhead on Kaukama Rd in Kailua after the 9th light pole on the right-hand side. Go at sunrise for a truly spectacular view! 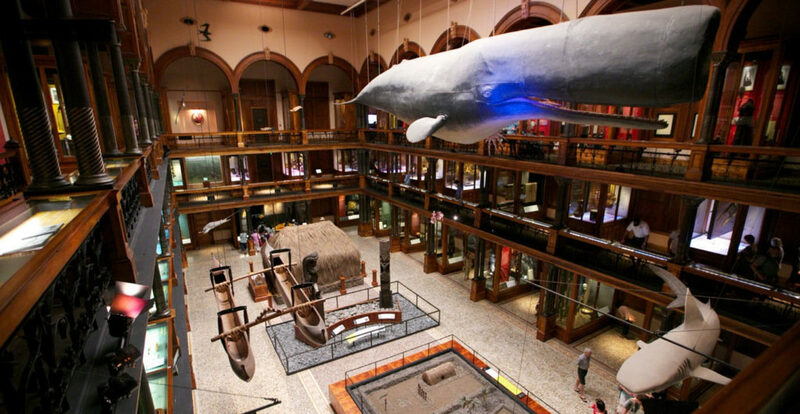 The Bishop Museum holds the world’s largest collection of Polynesian cultural artifacts. With 24 million specimens total, it also houses the US’s third largest inspect collection. Moana fans will love the brand new Holo Moana: Generations of Voyaging exhibit with interactive components. If you have time, swing by the planetarium. This is a great indoor activity if you find your self-rained in. Dole welcomes visitors onto their working plantation. Take the pineapple express train tour of the fields, did you know it takes almost 2 years to grow a pineapple? Find your way through a pineapple maze or stop in the gift shop for a taste of their famous dole whip! Stroller Friendly. Educational. Best for toddlers and children. The path to the Maka Puu Lighthouse can be steep, but it is stroller friendly! It’s known for being a high payoff hike in that it’s low/moderate difficulty with fantastic views at the top. The hike ends at the Maka Puu lighthouse with great views – especially during whale watching season (Jan-March). Go early to avoid the heat and crowds. Stroller Friendly. Active. All Ages. 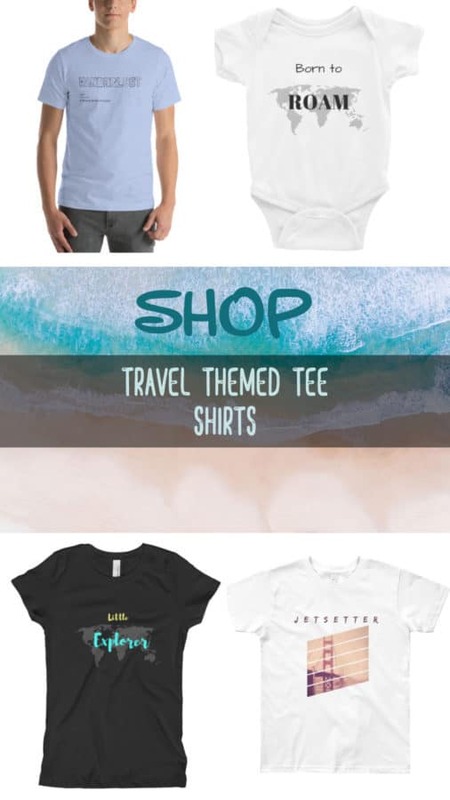 Now that you know what to do when you’re not on the beach, check out the best beaches on Oahu to really make the most of your trip!